A possible future sticky depending on response. In addition to helping resolve doubts about whether hypothetical specs will result in an actual chair that meets its intended objectives, I have found that one can learn a lot about the various products and their individual nuances by comparing CAD drawings. Over the past year, a number of members have posted their CAD drawings on this forum. It struck me that a single thread devoted to CAD drawings could become an invaluable resource for somebody looking to spec out their own chair. 1) Make sure any personal information has been removed from the drawing. 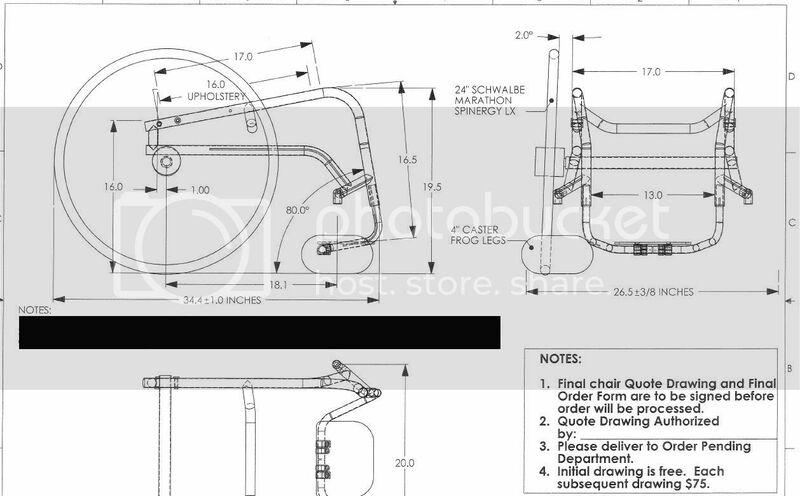 3) If the actual chair has been delivered, post the CAD, a brief description, pics, and specs. 4) To keep the thread focused, post a separate thread for discussion and link to that thread. This should limit off topic excursions. Additionally, those who are posting their CAD in order to get advice will have their own thread devoted to their future chair without derailing the purpose of this thread. It is my hope that this thread with the suggested protocol could create a truly unique repository of specific product information for reference while at the same time providing a way to address the needs of those who need help by linking to individual threads. I know my "protocol" sounds like a lot of hassle for some, but spec'ing out a custom ultralight is serious business. I have a feeling that those of us who go through the trouble of actually getting a CAD drawing won't mind the additional work. Let's see where this takes us. I'll post an example shortly. Until Picasso's thread a couple of years ago, I didn't know this was even an option on ZR models because it was not in TiLite's Designs Unlimited .pdf. NOTE: Chair as pictured has non-factory options: chrome & stainless fasteners, bicycle lights, cafeteria tray under seat, brass side-guard shims. I especially love the adjustability, Natural Fits, flip-back footrest, D's Locks, Schwalbe MPE tires, and the general fit and trim of the chair. I chose an aluminum chair because weight is not an issue for me. 24” standard Spinergy wire wheel. Last edited by chasmengr; 04-28-2011 at 12:33 AM. I am a person with mild/moderate hexaparesis (impaired movement in 4 limbs, head, & torso) caused by RRMS w/TM C7&T7 incomplete. "I know you think you understand what you thought I said, but what I don't think you realize is that what you heard is not what I meant." Did you get a full CAD drawing with your specs? I can't recall if you posted a CAD or just a sketch. For all I know, you might have given them the drawing. It sounds like Oracing uses slightly different specifications when they build their frames. It would be an excellent addition to the CC CAD Repository. 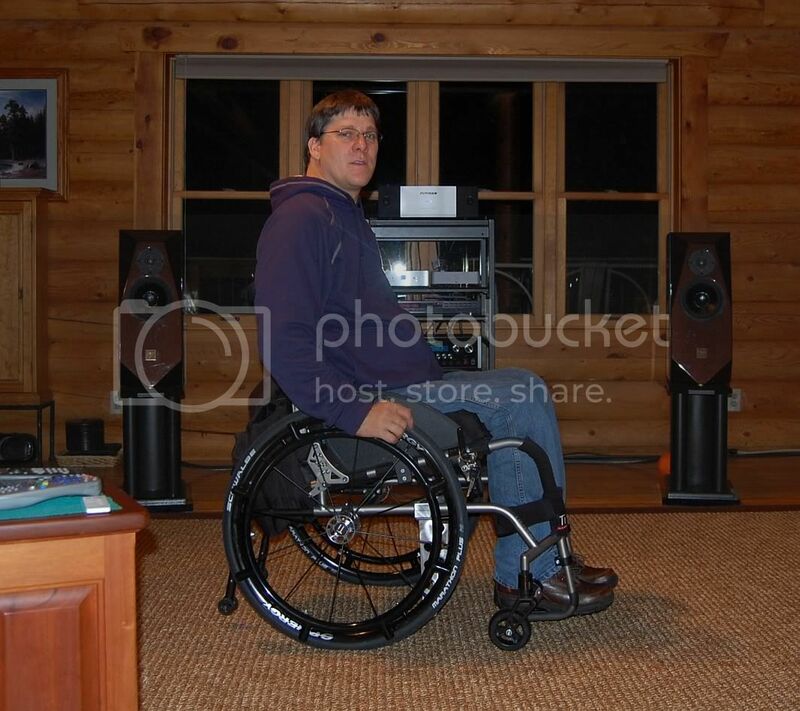 Here you`ve got it, is a Xtreme Box with 24" rear wheels and 4" casters and aluminium side guards without fender. The measurements are in millimeters, 1"= 25.4 millimeters. I will post pics once this monster is made. - Ti 12"-16.5" Folding Adj-Ht Back Set @ 12"
Nice to see the 3 hole bearing fork instead of the 2 hole short bearing fork. Last edited by SCI_OTR; 05-25-2011 at 09:39 PM. Here is the monster before going to powder coating. Seat to Footrest Length: 17.5"